"A comedy about life, love and the gentle art of raising children." "Parenthood" is a dramatic comedy film that was directed by Ron Howard and was penned by the comedy writing duo of Lowell Ganz and Babaloo Mandel. 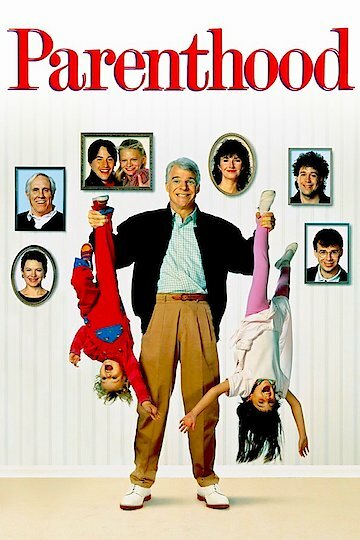 The film had an all-star ensemble cast that included Steve Martin, Rick Moranis, Tom Hulce, Mary Steenburgen, Dianne Wiest, Martha Plimpton, Jason Robards, Harley Kozak and Keeanu Reeves. The central figures in the movie are the Buckman siblings and their offspring. Frank and Marilyn Buckman are the retired parents of their daughters Helen and Susan and their sons Gil and Larry. Helen is the oldest of the group and she has her own issues. She is a divorced single parent of a confused and angry pre-teen son and a wild and rebellious teenage daughter. Gil and his wife, Karen, are the parents of three children including their oldest son who is very emotional and has stress that an eight year old shouldn't be burdened with. The stress of raising the children gets to Gil but he is insistent that his children have a father figure that he never had. Susan and her husband, Nathan, have only one child who is academically gifted. Their kindergartener can perform complicated math equations but is awkward socially with other children. The youngest of the Buckman offspring is the free spirited and trouble making Larry. Larry stops by every now and then to borrow money to fund gambling debts and his investment schemes. Each character struggles with raising a family. A lot of the issues and problems are often littered with amusing moments. Gil goes out of his way to make his son's 8th birthday a special one but has to step in as a party cowboy when the hired mascot doesn't show. Helen's daughter runs off with her underachieving boyfriend who wants to be a drag racer. When things reach an emotional head for everyone in the family, the eldest member of the family, Marilyn's mother, compares raising a family to riding a roller coaster. The whole breed fights to achieve happiness and success in life. Parenthood is currently available to watch and stream, buy on demand at Amazon, Vudu, Google Play, FandangoNow, iTunes, YouTube VOD online.